Announcing the New & Improved Hauspanther Gear Guide! Your Ultimate Cat Product Shopping Guide for the Holidays or Anytime! The Hauspanther Gear Guide is back and it’s better than before! 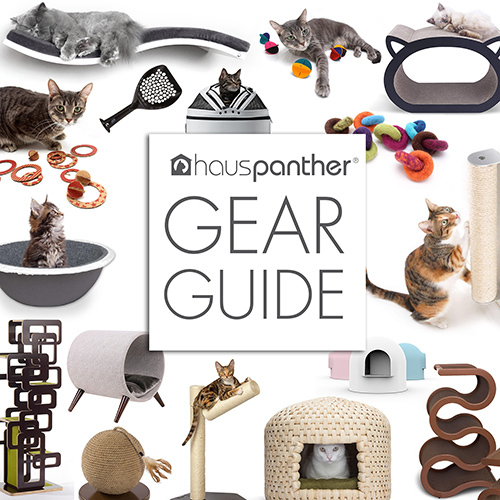 Our Cat Gear Guide is your ultimate one-stop resource for finding the coolest cat products. We’ve gathered all of our feline design finds into a comprehensive online resource that allows you to easily search by category and see a list of every single item we could find that’s stylish and useful for cats, plus there are links to where to buy at your fingertips. I created the Hauspanther Gear Guide to make your life (and mine) easier! I’m frequently asked questions like “What are some cool cat towers I could get for my cat?” or “What are your favorite catnip cat toys?” and I found that it can be difficult to search through our Daily Design Finds archive to find exactly what I’m looking for. I wanted to create a place where everything is listed in a user-friendly format. I’ll be updating the Gear Guide regularly, adding new items as I find them and deleting old items that are no longer available. If you know of a product that I should add to the guide or if you find a broken link or something else that needs to be updated, please send me an email at submissions@hauspanther.com. I promise to make this the very best resource that you could ask for, so let me know what other categories you want to see, too! Enter to Win a Catnip Candy Cane Card + T-shirt from Stark Raving Cat! Thank you for putting together the gear guide! I hope it stays up past the holidays as it’s a great reference for all things modern for cats! Looks great but shouldn’t guides include prices? You know, so we don’t have to click every single link to see if something fits in our budget? Yes, that would be ideal, but prices change frequently and vary at different retailers, so it’s hard to keep everything updated. Maybe I could add a price range to each item, would that be useful? A price range would be great! Everything I’ve come to appreciate and expect from HausPanther — well-designed, easy to use, and very attractive. Huge props to you, Kate!